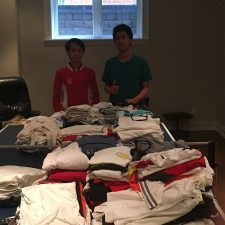 The following is a summary submitted by Tyler and Spencer Keung to report on the success of their 100-100-100 Campaign on behalf of the Philpott charity. A portion of their collection, in the form of racquets, tennis bags, clothing and shoes was distributed at a recent Philpott meeting for youth who have grown up through our program. Everything was enthusiastically and gratefully received. Next the collected items will be given to our youth volunteers, who have also grown up and learned their tennis through the Philpott program. Heartiest congratulations to Tyler, Spencer and their team who worked tirelessly to ensure the success of this campaign!!! “We are thrilled with the success of our 1st year initiative to help the Philpott Inner City Children’s Tennis Fund. We would like to thank everyone for helping us reach our goal this year. We collected a total of 37 bags, 79 pairs of shoes, 47 racquets and 200 lbs of clothing! These contributions will benefit many Philpott children this summer. A special mention to Simon Bartram and the Toronto Lawn for donating a large portion of the items. Another special mention to Sophie Ronan for her energy and support, helping guide us through the first year of our campaign. A huge thank you to Adidas for donating some new Adidas clothing & shoes. We also managed to get a $1000 donation from RBC. We received tremendous support from the tennis community for our campaign and we hope to continuing to grow the campaign next year. Once again, A GREAT BIG THANK YOU to everyone for helping make our 1st year a success!